Why Buy Residence in 63 Golf Drive in Gurgaon? India has boarded the bullet train of development from the past few years. It is progressing at a very rapid pace and has left many countries far behind in terms of advancement, which were once parallel to it. The economy of the country is booming at a swift speed and has outshined in the entire world. Foreign countries see India with a view of investment which will yield them high returns in the future. India has become a perfect hotspot for the real estate sector. The property bazaar of the country is getting hotter day by day. There is an immediate need for affordable housing projects in the nation. India is the second most populated country in the entire human race. The population is still increasing at a very alarming rate. There has been a scarce requirement of affordable housing projects such as 63 Golf Drive in Gurgaon. Accommodation problems have started rising in India because of the rising populace. The property rates in the nation are touching sky scraping heights. People want to take advantage of the prosperous economy of the country and they are ready to buy property in India at any cost. Gurgaon is also a metropolitan of the country and is an ideal model of excellent infrastructure. The standards of living of the city are quite high which tempts masses to have a residence here. Famous realtors like the Baderwals have set up their housing plans in the metropolis. 63A Golf Drive is a famous range of affordable residential apartments located in Sector 63A in Gurgaon. It is well equipped with all the current day luxury amenities such as clubs, gymnasium, yoga and meditation center, kids playing arena, basketball court, tennis court, free parking, power backup, swimming pool and many other features too. 63 Golf Drive in Gurgaon provides all the lavish facilities with a price that is just beyond your imaginations. There was no such revolution in the affordable housing segment, until the Baderwals came on the floor. 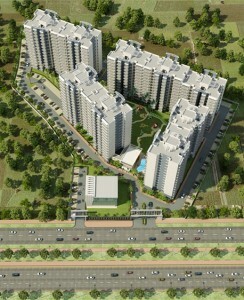 The project is fully approved by the Haryana State Government under the Affordable housing Scheme Act. The residences in 63 A Golf Drive in Gurgaon will be allotted through a procedure which will be presided over by the government of Haryana.